Happy February and happy birthday, Charles Darwin. This month, we have some sad news but we have some great news for our commuunity as well. I always start with the bad news. It’s like eating a salad with those terribly bitter herbs in them. Just get it out of the way and then go for the mangoes. My salads have mangoes in them. Keep reading for your mangoes or bacon bits or chocolate-covered lettuce or however you cope. But in all seriousness, I’d like to start with somber news. My dearest members, it is my sad duty to inform you all that one of our finest members is no longer with us. Allan actually lived in Alaska, but frequented Arizona to take advantage of Arizona’s daylight during the winter months. Words are insufficient to do him justice as Allan’s quick wit and awareness of the complexities of situations could only be fully appreciated in person. He had a kind heart and a strong will to back it up. If something wasn’t right, Allan never hesitated to speak up and speak out. Though he used a walker and seemed frail, he drew a massive strength from his passions and was a force to be reckoned with and, as I quickly learned, not to be under-estimated. Here is the obituary published in the Anchorage Daily News. Allan Adasiak died on Jan. 25, 2017, in his winter home of Mesa, Ariz. He was 77. Mr. Adasiak was born in East Rochester, N.Y., to Henry and Elsie (Carnecki) Adasiak. He graduated from San Leandro High School in California, attended Princeton University, and later transferred to the University of California, Berkley, where he met his wife, Janette Peterson. They married in 1964 and shortly thereafter packed up and drove the Alcan to Alaska. Allan was a reporter for the Anchorage Times, the Anchorage Daily News and Alaska Magazine. He served as press secretary for Governor Wally Hickel, then as a special assistant in the Department of Law. He helped craft the regulations that created the Alaska Commercial Fisheries Entry Commission and ultimately became the CFEC’s head commissioner. After moving to Anchorage, Allan worked as a private investigator and technical writer, serving as one of the investigators on the Exxon Valdez oil spill. Allan enjoyed his years singing with the Anchorage Concert Chorus and performing in local theater in Juneau and Anchorage. He firmly believed in exercise to preserve health and was a regular at Anchorage swimming pools and at Gold’s Gym for many years. More than anything, Allan loved reading and discussing ideas, and he was passionate about writing. He was a classical music and jazz enthusiast and supported the arts. An adventurous spirit, Allan loved to travel and spent many winters of his retirement living in Turkey, Thailand, India, Malaysia, Argentina, Mexico, and finally Arizona. Employing his interview skills as a reporter and his keen sense of humor, Allan had an ability to make friends everywhere went in the world. Allan is survived by his wife, Jan Adasiak of Anchorage; his daughter, Anne Adasiak Andrew (Tim) of Anchorage; grandchildren, Juliana and Eric; and son, Paul Adasiak (Laura) of Fairbanks, Alaska; grandchildren, Eleanor and Josephine; and his sister, Paula Tillson of South Lake Tahoe, Calif.
A memorial gathering is planned for Feb. 25, 2018, from 3 p.m. to 6 p.m. at the Sons of Norway Lodge, 8141 Briarwood Street in Anchorage. Allan was a wonderful friend and dedicated Humanist. He will be sorely missed, but never forgotten. Thank you for your friendship and your contributions to our community, Allan. This is a window into our children’s room. A rock had been thrown through it and there are several BB-pellet holes. There is just a little bit more bad news, but I promise it will be followed up with some really good news! Please stick with it! I’m sure most of you have noticed that we’ve had to board up one of our windows. Upon closer inspection, further damage becomes evident. There is only one rational conclusion. The neighbor kids got BB-guns for Christmas. Yes, most of our south-facing and west-facing windows have been shot with BB-guns and the west-facing window in the Children’s room had a rock thrown clear through it. Some of our flood lights have also been shot out. This has been a very time consuming process: running out to buy plywood, fashioning a replacement window in the complete darkness while pulling glass out of the window frame and carpet. 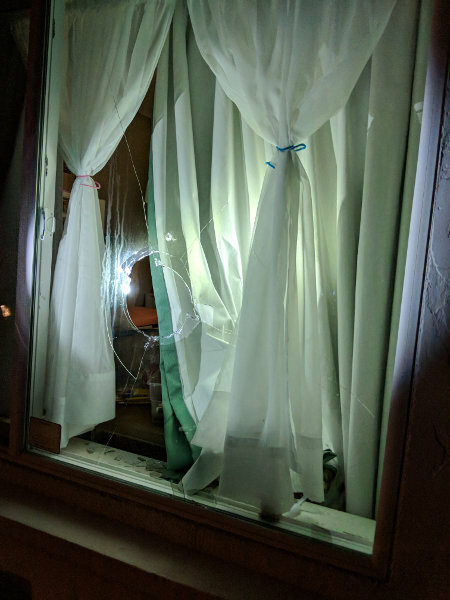 One of our Property Directors, Joe Blankenship, has taken the lead on this to work with the insurance company and get estimates for replacing all of the windows damaged by this senseless act of vandalism. Joe has been doing an amazing job with this problem. Be sure to say thank you to Joe for his service! You might be thinking, “what have we been doing to prevent this in the future?” Great question! One of the most productive steps that we’ve taken is walking the neighborhood. Joe Blankenship, Chris Appleton and I walked the entirety of the Butterfield apartment complex and spoke with everybody who was home. We explained our situation and had really good discussions with our neighbors. The result? We have really awesome neighbors in the Butterfield apartments. We’ve also been working with Mesa PD to help understand the neighborhood and step up patrols. We are reaching out and working more closely with the department to help improve the community and protect the community center. The police department has strongly recommended installing cameras, so that’s our priority at this time. To help curb the vandalism, we’ve purchased security cameras however it will require a lot of work to run conduit to safely and correctly hook them up. Once the cameras are installed and working, we’ll replace the windows. We just want to avoid replacing the windows for a second time before the cameras are in place. Please pardon our dust while we do this the right way. We hope that you understand! 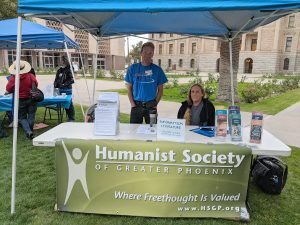 As a member or guest of the Humanist Society of Greater Phoenix, you’re probably a non-theist and we’re a non-theistic community! Roy Speckhardt of The American Humanist Association needs your input! He’s putting together a dissertation and needs raw data from awesome people like you. He needs quite a few people to participate. It only takes a few minutes and is completely anonymous. After you’ve participated you may optionally sign up for a chance to win a $20 gift card. HSGP is not running the gift card contest. We are not affiliated with Amazon, Inc. No endorsement by Amazon is expressed or implied. Every year, we Humanists get together and celebrate the accomplishments of thousands of scientists and medical professionals. The Theory of Evolution by means of natural selection is one of the single-most, well-supported scientific achievements. Our entire modern medical institution is based on the reliable conclusions starting from the observations of Charles Darwin while reflecting on his time traveling the world on the Beagle. In honor of the achievements of Darwin and all of those scientists who followed in his wake, we held our annual Darwin Day BBQ on Saturday, February 10th, just 2 days before his actual birthday! We had tons of food and lots of great, fun conversations. Our delectable menu consisted of cod, salmon, tilapia, chicken, BBQ corn, BBQ potatoes, corn, steamed Brussels sprouts, primordial soups, dinosaur (chicken), and lots of tasty desserts! Everybody had a great time and it was a very successful fundraiser. Thank you so much for helping make this event so fun for all of our new guests and current members! A special thank you to Alex Zygmunt for picking up the lion’s share of the food! Thank you also to our Rock-star-Roxanne for working extremely hard, preparing vegetables and soups, and cleaning up. A huge thanks to grill-master Damien for cooking all of the fish, hot dogs, and potatoes! A big thank you to Patty Ward, Pete, and Teresa Cokl for salad preparation and cleanup! Thank you Anita and Christina Hepler for being our cashiers for the day as well! These events are always big team efforts, but many hands make lighter work. Volunteers like you are the life of our community. Thank you so much for putting in the love we need to ensure that we continue to not only survive, but thrive and grow as well. Though we’ll see you next year, we hope to have more events like this to take advantage of the great Arizona weather. Do you like our Sunday Speaker meetings but can’t always be there for them? Subscribe to our YouTube channel, Humanist Society of Greater Phoenix, to always catch our latest videos and click the bell icon to be notified of when we’re live streaming and when we’ve posted a new video. Your likes and subscribes help promote our videos and will help our channel grow. Thank you for your help! Please enjoy our programming! We Humanists once again attended the Secular Day at the capitol along with several other secular organizations in the state. This year, they had a huge turnout, despite the unusually cold and threateningly rainy day. Alex, Carol, and I met a lot of great leaders and secular people eager to learn about our community and to support our mission. Thank you to all who braved the cold and reached out directly to their lawmakers on, of all days, Darwin’s birthday. This is how you change minds and this is how progress is made! That’s all for this month! Don’t Panic and we’ll see you next time!